Congratulations to "Anita S.", the winner in B.J. 's giveaway. Thank you to all who participated! A cowgirl at heart, Bo Hamilton does her best thinking in wide-open spaces. So when money goes missing from the family foundation, Bo rides into the Crazy Mountains to figure things out. But a killer hiding among the sawtooth ridges takes her captive and isn’t planning on ever letting her go. Bo’s disappearance gets folks thinking she’s the guilty one who’s run off with the money, but Jace Calder would bet his ranch that she’s innocent. Not that he has any reason to trust the beautiful, spoiled senator’s daughter. Still, Jace is going after Bo and bringing her home to face the truth. But in the wild, rugged Crazy Mountains, he finds Bo at the mercy of a suspected murderer. Jace is her only hope, and he’s about to find out what they’re both made of. BJ Daniels, a USA Today and New York Times bestselling author, wrote her first book after a career as an award-winning newspaper journalist and author of 37 published short stories. That first book, Odd Man Out, received a four and a half star review from Romantic Times magazine and went on to be nominated for Best Intrigue for that year. Since then she has won numerous awards including a career achievement award for romantic suspense and numerous nominations and awards for best book. Daniels lives in Montana with her husband, Parker, and two springer spaniels, Spot and Jem. When she isn’t writing, she snowboards, camps, boats and plays tennis. She is a member of Mystery Writers of America, Sisters in Crime, Thriller Writers, Kiss of Death and Romance Writers of America. A copy of LONE RIDER will be given to one person leaving a comment or email entry. Giveaway ends 11:59pm EST July 31st. Please supply your email in the post. You may use spaces or full text for security. (ex. jsmith at gmail dot com) If you do not wish to supply your email, or have trouble posting, please email maureen@justromanticsuspense.com with a subject title of JRS GIVEAWAY to be entered in the current giveaway. US residents only. I'm in the middle of the Beartooth, Montana series and really enjoying it. It's clear Daniels knows this part of the country really well. I have enjoyed books by BJ Daniels before... really like the sound of this one! I have read B.J. Daniels books but it's been awhile. Lone Rider looks like a great book to read and a good place to start reading her books again. I love western novels and if you add suspense, it's perfect. That's how I feel about B.J. Daniels books. My favorite one so far is Atonement (Beartooth, Montana, #4). 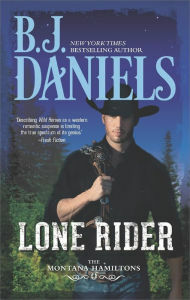 After reading the synopsis of Lone Rider, I am wondering if it may get bumped to second favorite. Discovered your books through HQ Intrigue series. Been hooked eer since.